Last week we briefly explored one aspect of Japanese courting practices. If you've ever seen the Japanese classic Battle Royale, you'll no doubt have heard "suki" (I love you) more than a few times before everyone was dead. Today, however, I want to talk about another, harder to observe side of dating in Japan. Again, a quick disclaimer: I'm nowhere near an expert on this subject matter. I'm just sharing my observations. That said, it really is a difficult subject to analyze. It's a secret little world that is very nearly impossible to completely infiltrate, although glimpses are plentiful to those who pay attention. Yay, freedom! When you get married, you can finally tell people you're seeing someone! 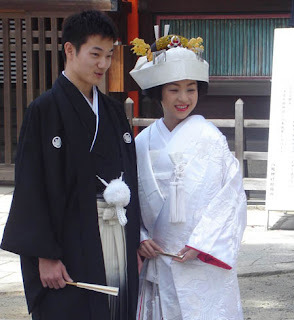 Many Japanese relationships, prior to marriage, are characterized by a sense of secrecy and discretion that is taken very seriously. Of course the degree of this behavior varies from couple to couple, and I think younger Japanese today, although still affected by this social more, are somewhat more open in general than those of prior generations. I'm sure this tendency towards stealth dating is part of the overarching societal social phenomena of honne and tatema. Basically, it's separation of the "real" (private) self and the "outward" (public) self. In Japan, there is a much stricter distinction between the spheres of public and private life than in many Western countries. It may also have to do with old Confucian influences. Regardless of why, though, this is how it is. My first girlfriend, though we started dating in America, was very shy in public at first. She was embarrassed to hold hands or have any real physical contact when there were any people around or when we were near her university. When we were with our mutual friends, she acted as if we weren't a couple. It was very frustrating and took a while to work through, and she couldn't really explain why she behaved like that - it was just what felt right to her. Two of my other female Japanese friends explained that she was "too Japanese," which left me scratching my head as to what the problem was. A friend of mine who is dating a Japanese girl noted to me that she has always been rather reserved about introducing him to her friends, and they have been together for over 3 years now. A work friend of mine (who is Japanese) practically never talks about his girlfriend. All I know is that they've been together for 14 years and he is going to propose to her sometime soon. Another work friend of mine (who is Japanese and female) has a secret boyfriend. In other words, I found out that she is dating someone (a former coworker) through outside channels - she never talks about him or the fact that she is even in a relationship. My last relationship was a good example of this aspect of Japanese dating. Let's just say that in Japanese schools (and perhaps many other work settings), dating your coworkers is discouraged. If the school authorities find out, one of the offending parties will most likely be transferred out to another school. That's not to say that it doesn't happen - it does, quite often from what I hear. But man, keeping it hush-hush is hard work. You might be thinking "Oh, it's like an adventure! Keeping secrets is fun!" Wrong. You have to watch how you interact in view of coworkers. And you can't just ignore each other, because that is too obvious. No, you have to be friendly, but not too friendly. You have to be careful not to get too familiar at work. And when you go out, you have to be careful...if you run into a student or a coworker, you're in for it. The rumors at school will start, and...well, let's just say I didn't want to deal with it anymore after a couple months. These are just a few examples - it really is a very widespread behavior from what I've heard and seen. But what do you have to say on the topic? Have you dated someone from Japan or another country? In your experience, were they more or less open about dating than we are in the States? Thinking more about this, I wonder if your experience was actually indicative of the Japanese dating scene as a whole. She was not the "average" Japanese girl in any sense of the word, and I hope you agree with me here, especially seeing as how the other 4 girls around called her "too Japanese" (which seems a bit ironic). I've noticed much more physical displays of affection being seen around town these last few days, even more than I remember from past stays. I think it's not so much discretion as a reticence to mix social circles. This compartmentalization comes with it's own problems which I have experienced, but I think maybe you could add something about this too any future treatment of the subject. Perhaps it wasn't that your co-workers was hiding her relationship from you, she just maybe didn't deem it necessary to alert you to that fact as you would probably never meet him/her seeing as how you exist in separate social spheres. Did you ask them if they were in a relationship and they lied or was it simply not offered to you? The answer to that question would be important to whether or not my theory could stand. Hmm, you're possibly right. As I said, I have limited experience on the subject and am primarily drawing from that and what I have heard and seen from other people. I also think that younger Japanese people, especially before they go to work (up to and including university) act somewhat differently these days than their elders. There's a social stratum there that could also affect this behavior. As for my female coworker, I never asked her - I had no reason to other than being to potentially creep her out. A mutual friend of ours who was interested in her did bring up the topic, at which point she was forced to admit she had a boyfriend, but she entreated him to keep it secret. Hmm. So it is somewhere in between the two answers I thought were the possibilities. My first instinct is to just say "balls," but I will restrain myself. "Have you dated someone from Japan or another country? In your experience, were they more or less open about dating than we are in the States?" Let's see... I dated a guy from China. He was from the South- near Hong Kong- which is a LOT more liberal than northern China. MANY differences- I could go on and on (if you're ever curious you can ask me sometime). Anyway, he was open about hand holding etc. showing that I was his 'girlfriend' and even though I wasn't "officially" his girlfriend because I didn't want to commit; he still told his friends in Chinese that I was his girlfriend. Haha.. Guess it was easier for them to understand that way? I'm not sure, but to the school community we were just really good friends and to the Chinese group we were a couple. My Chinese girlfriends from the North would tell me- "Be careful! I think he has a crush on you!" *facepalm*... Yes.. I know.. I did NOT date a French guy (though asked) for the purpose of.. well.. common sense. The French guys at my school brag about the girls they had the night before, you get the picture. I know it sounds like the jerks in the U.S. but it really is more extreme in France in my opinion. I once got the line - well something to the effect- "Come have some wine with me by the Seine River as we watch the sun set." I was Wowed. Asked him how many times he used that line before (he was a little confused). He had been a friend I talked to, but after that rejection his ego was bruised so badly he never talked to me again. The couples that were actually couples in France were, however, very public. That was similar to the states.